Let’s get the obvious question out of the way: yes, while I default to “hot dish” no matter how hard I try to the contrary, a hot dish and a casserole are essentially equivalent. From all the food blog reading I’m up to these days, I think the midwest might be in the minority on this one, but since I embrace my Minnesotan roots it’s a hot dish in my house. Anyone (ahem, Steve) who refuses to acknowledge that gets celery for dinner. Without hummus. So from the name, now you may recognize that this dish is a riff on a classic American tuna casserole(!). See, I try to be fair to all regions. You know the one, though. Joy of Cooking, in all its new edition glory, didn’t even dare to mess with the frozen vegetables and cream of mushroom soup. And don’t get me wrong, even though there are all these processed foods that I know are so harmful and won’t go near, I haven’t been broken of loving the taste. I don’t care how many times people say you’ll lose your cravings for hot dogs if you quit eating them long enough–they still look and smell delicious and send me salivating even just writing about them (the all beef kind, though, definitely not the bologna-like Oscar Meyer weiners). Turning the tuna hot dish into some dry salad with a vinaigrette wasn’t going to cut it. There’s no resemblance between a bite of romaine salad with some dry tuna and canned corn and the glorious oven-baked American institution in a pan that I grew up with. I’m not really sure at what point in the brainstorming process it ended up as a hot, crispy-crusted fish cake, but I believe there’s actually a chance you’ll be reminded of tuna hot dish when you bite into one. Try that theory when you serve it, without telling people the name of the recipe. The fish cake can be eaten with a side salad as a filling entree, made into mini cakes and kept warm for an appetizer at your next party (they’re particularly kid friendly, I think), or sandwiched into a bun and served with fixings (I’d do dill pickles, havarti cheese, and thinly sliced red onions) if you prefer things between two slices of bread. Of course, that does negate the gluten-free part. Which, did I mention, I achieved with a crushed potato chip binder?? 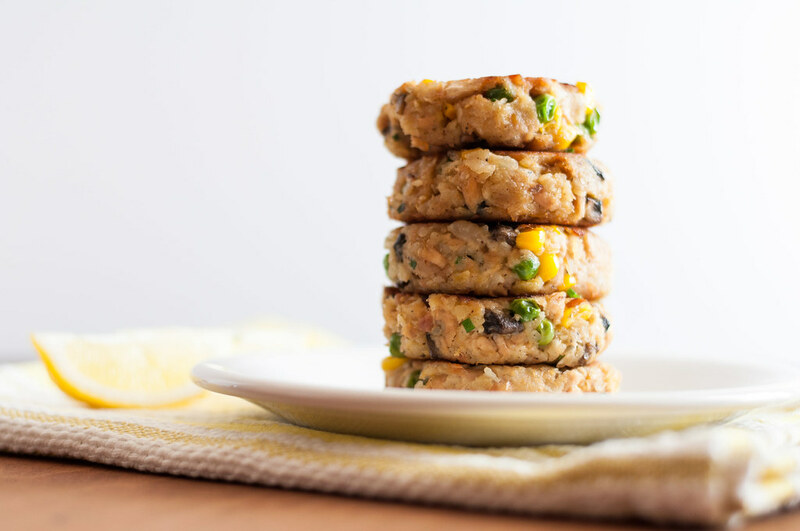 No grainy almond meal or flax, no egg overload (just one, unlike many gluten-free veggie burgers or fish cakes), no expensive gluten-free bread crumbs. 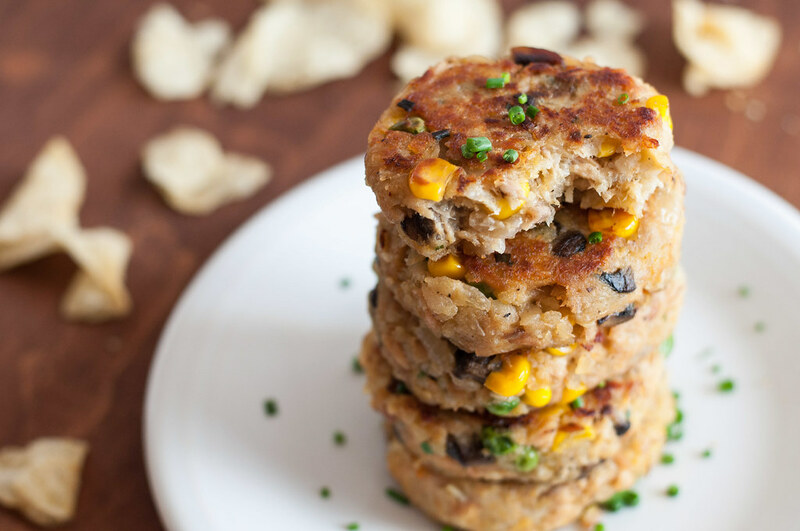 I saw a few fish cakes that used cooked potato as a binder, but then I was like–no extra steps, I’m going to try chips! In all honesty, I’d rather eat them in their salty addictive uncrushed form, as I did with the half bag I have left, but they make this recipe so easy. Not only do they add fat, decreasing the total mayonnaise used, add seasoning, saving you the tasting debate over how much salt and pepper to put in, but they’re pros at soaking up the moisture around them and expanding to hold the whole cake together as it cooks. I had some deep musings over the need for a binder at all in creating this recipe, so if you’re a little food science challenged, don’t be tempted to leave out the chips or the egg. I’ve thought it through. 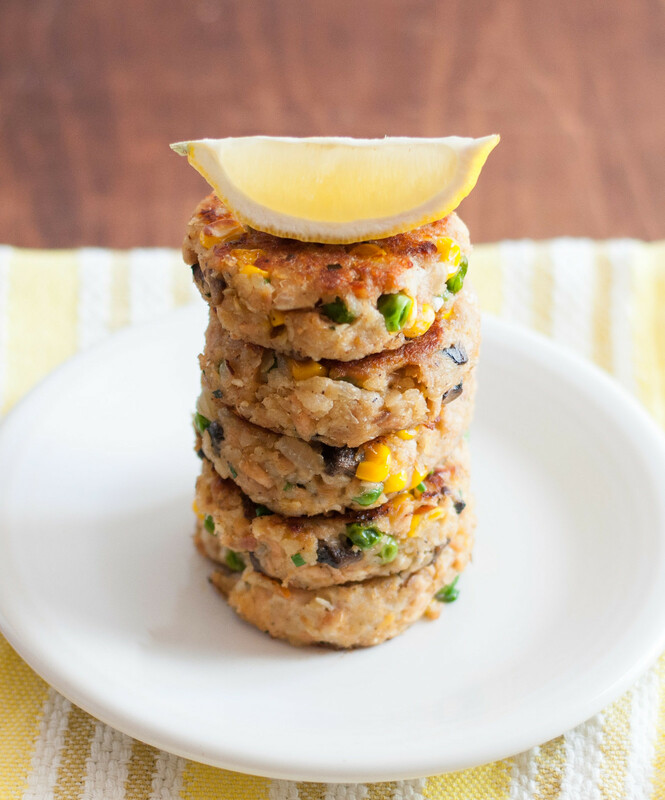 It may work slightly, but if it does work, you’re going to have some very fragile tuna cakes on your hands. Literally, as they fall apart in transport to the plate. The cakes are really rich, so I struggled with how to sauce these. And as much as I love dipping things, I think the answer is “minimally”. There’s wayyyyy enough creamy texture in the cakes themselves, so I didn’t pair them with the usual mayo or sour cream based sauce. The whole experience was well balanced with just a squeeze of lemon, but you could also drizzle some sriracha, just be careful if you’re using hot sauce in the cakes so as not to over spice them. You might also notice a little discrepancy between the recipe and photos, which were taken on my first test run. I show the peas and corn whole, but you’re best off with a rough chop or pulse in the food processor. If you like the look of whole pieces, they did work okay, but the vegetable chunks are large and cause some instability in the structure, as well as falling off the outside of the cake when frying. Then corn pieces start exploding in your face–not a good way to encourage you that frying anything is a safe activity (which it 100% can be!). P.S., don’t worry, I’m not talking about deep frying. A mere 1 teaspoon of oil per cake will do you. In case you missed it, I put up a reallllllyyyyy long blog post about everything I ate on my recent trip to Dallas. 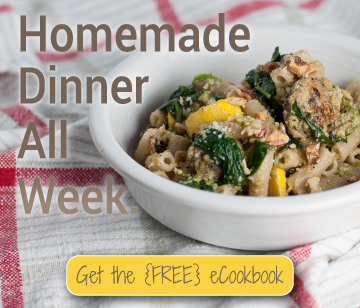 If you’re looking for ideas or just some fun, non-recipe reading, it’s right here. I’m always looking to branch out and do some different post topics, so if there’s every anything specific you want to see, don’t hesitate to ask! Roughly chop the peas and corn or pulse a few times in a food processor. You still want recognizable pieces, but cutting down the size helps the cakes hold together better. Melt butter in a large nonstick pan over medium heat. Add mushrooms and toss to coat. Stir after two minutes, then allow to cook another two minutes undisturbed. Add onions and ½ teaspoon salt, reduce heat slightly, and cook 7 to 8 minutes, stirring occasionally, until onions are very soft. Return heat to medium, add corn and peas, and cook 3 to 4 minutes, until warm and thawed. Stir in a pinch each of salt and pepper, plus desired amount of hot sauce if using. Empty mixture to a bowl and put in the fridge to cool quickly. In the meantime, process the chips to a fine crumb (a minute or two of pulsing). 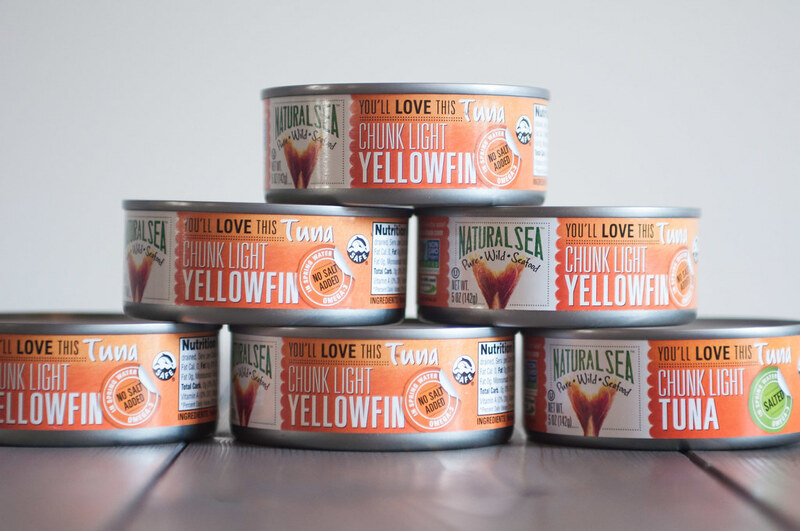 Flake drained tuna into the bowl of mushroom mix once cooled to room temperature or colder. Add chip crumbs and chives and stir, breaking apart large tuna chunks. Stir in mayonnaise and mustard. Important: taste NOW before adding raw egg. The egg acts as a binder and shouldn’t affect the current seasoning much. I added a pinch of salt and ¼ t black pepper. The chips I used were very well seasoned. Add unbeaten egg and stir until incorporated. 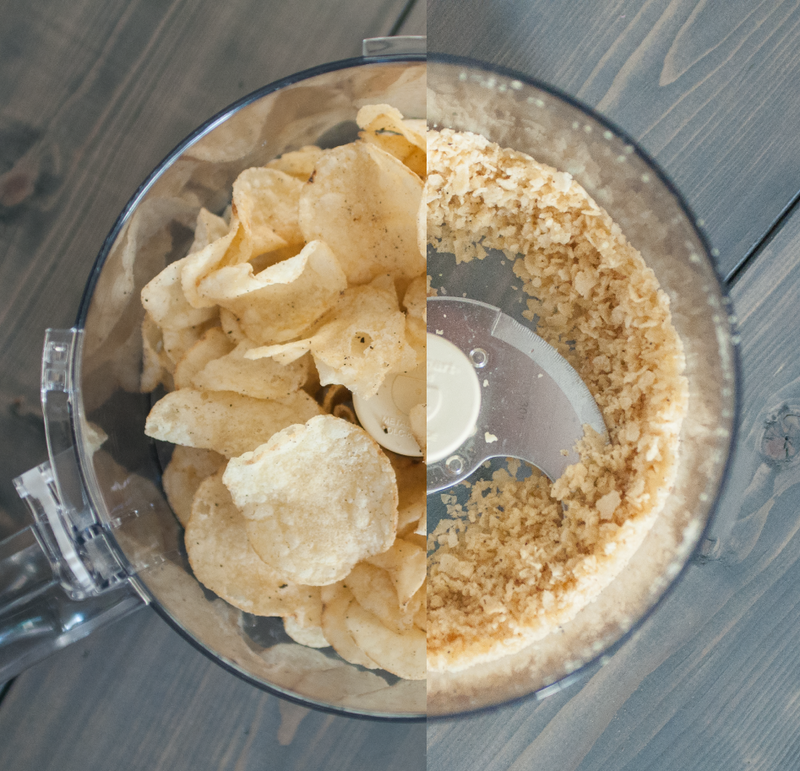 Refrigerate the mixture for at least 15 minutes, allowing chips to soak in moisture and bind the mix. Form patties of ⅓ cup each of the mixture, ½ to ¾” thick and 3 inches in diameter (palm sized). Wipe out the nonstick pan used earlier with a paper towel or dish cloth. Heat a 2 teaspoons of oil over medium heat for a couple minutes—you want it as hot as it will get over medium so the patties sizzle a bit when added. 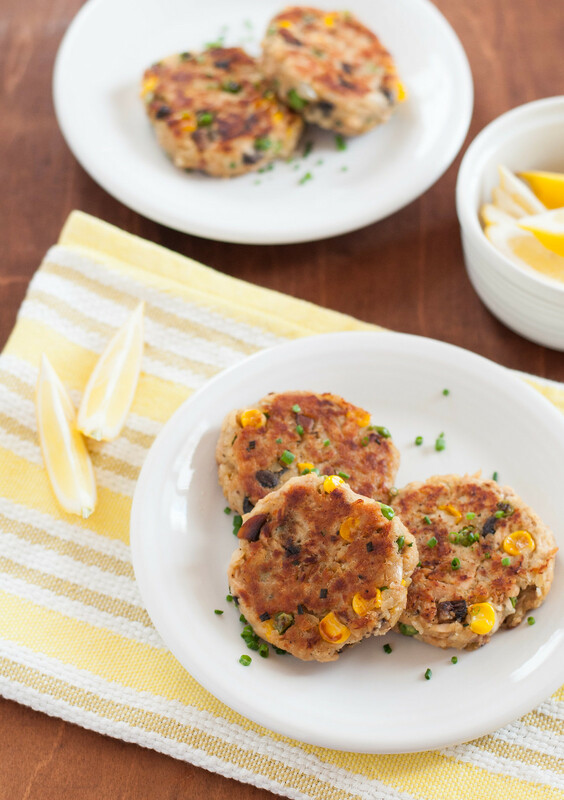 Depending on the size of your pan, add about two patties at a time, cooking 4 to 5 minutes per side. If the patties get too dark on the outside before four minutes is up, decrease the heat a little. The goal is to cook the patties (namely, the egg) through without burning the outside. Serve with lemon wedges and garnish with additional chopped chives (or some more potato chip crumbs for a fun look). If serving as an appetizer, form smaller cakes if desired. As long as they're not super thin, the cook time should be approximately the same. Keep warm on a wire rack in a low oven. Prep time includes 30 minutes of inactive refrigeration. To make dairy free, substitute olive oil for the butter. Substitute yellow mustard for dijon in a pinch. Make the mushroom and vegetable mixture in advance and store covered in the refrigerator for a few days, or mix everything and form the cakes, and store for a day in the refrigerator (shorter life once raw egg is added, and the chip crumb will start to absorb too much moisture, producing a mushy cake that doesn't hold together). Great shot on the chips – and this recipe – well, I’m soooooo excited! I miss my tuna noodle comfort! Thanks :) Chips aren’t exactly healthy, but the lesser of two evils I suppose. These are yummy, I’m just munching on one now!